IMA offers scholarships to graduate and undergraduate students based on specific criteria. Those who apply for the MEF scholarships are automatically considered for the SCMS scholarship which includes complimentary registrations for both IMA's Annual Conference & Expo and the Student Leadership Conference. 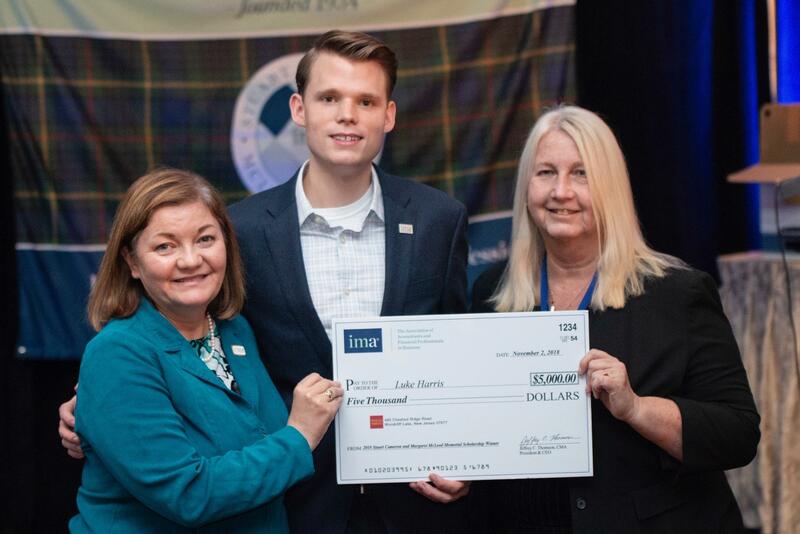 At the recent IMA Student Leadership Conference in St. Louis our president, Sue Bos , presented a large replica $5,000 check to the 2018-2019 scholarship recipient, Luke Harris, from Missouri State University The SLC was attended by 620 participants and so it made a perfect venue to showcase the central focus of the SCMS – encouraging the best and the brightest upcoming generation in our profession. We look forward to keeping in touch with Luke and expect he will also benefit from the mentoring opportunity that comes along with a relationship with SCMS leadership.